Integrated Project on Prevention of General Infections with focus on Hepatitis. 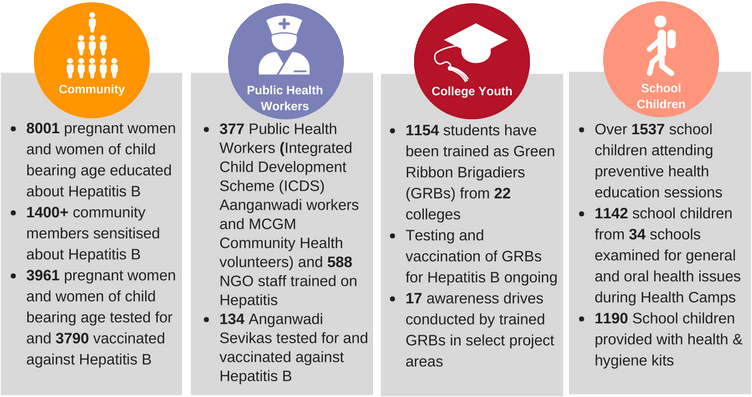 United Way Mumbai, with support from BMS Foundation, AmeriCares India Foundation and Hope Initiative collectively initiated an Integrated Project for prevention and education on general infections, with focus on Hepatitis B in F-North ward of Mumbai. As part of this, UWM is undertaking interventions under the aegis of SEHAT, with a vision of good health for all. The project follows on the heels of Yuvroshni (2010) and Pahal (2012-15), to work towards creating awareness and curbing the spread of Hepatitis B and C infections in the city with the addition of other infectious ailments.